Ok, then, no afro-mask. Looking good, Jefferson Pierce. News about the in-production Black Lightning TV show has picked up pace over the last few months, with a network change and lead actor casting. Now, DC Comics and corporate cousin the CW are unveiling the first look at Cress Williams in the Black Lightning costume. “I knew way too much about the world as a young boy growing up in Richmond, California. I was no stranger to violence, death, hopelessness or the feeling that no one cared about what was happening in my life. “Comics were a great way for me to escape. I was about 13 when Black Lightning was created, and finally there was a Black Super Hero that gave a damn about our neighborhood and our lives. 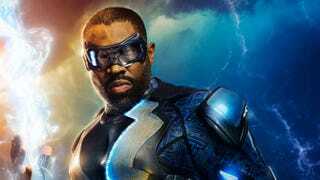 DC Comics/Entertainment and Black Lightning creator Tony Isabella have reached a mutually-beneficial agreement on Tony’s past and future contributions to the company. DC is pleased it will again have access to Tony’s talents and insights. Tony is thrilled to be once again associated with one of the top entertainment powerhouses of our era. This is good news all around. Super Friends character Black Vulcan is a famous example of mimicking Jefferson Pierce’s costumed alter ego so that Isabella wouldn’t have to be compensated. That’s all in the past now and Black Lightning’s future will boast a higher profile than ever before.